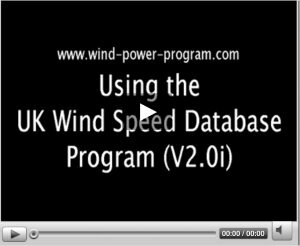 UK Wind Speed Database program - the NOABL database with postcode converter. Microgeneration Certificate Scheme corrections for terrain roughness. For the UK, there is a national wind speed database (known as NOABL - Numerical Objective Analysis Boundary Layer) available from the Department of Energy and Climate Change that gives estimates of wind speeds at heights above the ground of 10, 20 and 45 metres. It is based on the Ordnance Survey grid system and gives speed estimates at grid points 1 kilometre apart. However, it is not a very convenient means of accessing wind speed data and a program - described below - is available from our download page that is far more flexible to use. This program gives much better access to the database by being able to scroll your position to anywhere within the UK. It also gives an interpolated wind speed for any height above the ground up to 80 metres. The position input can be either an Ordnance Survey grid position or latitude and longitude. A postcode can also be converted to the nearest Ordnance Survey grid code using the conversion tool below. The resulting OS grid code can be used directly as the position input to the program. It should be noted that this post code converter does not apply to Northern Ireland, Jersey or the Isle of Man. A converter that does cover these areas is www.rensmart.com. The general features of the program are described below or you can watch a video about using program by clicking on the image below. The figure below shows screen captures of the program output for a location near to the Black Law windfarm in Lanarkshire. The position has been selected using the Ordnance Survey grid position and the display shows the easting and northing of the location. On the maps, the position is shown by a small blue circle. The map options are a topographical map of the whole of the UK, a zoomed topographical map 50 kilometres across and an Ordnance Survey road map also 50 kilometres across. An example of each map display can be obtained by using the forward and back buttons at the bottom of the figure. The topographical map is used because it demonstrates the general link between topography and wind speed as you scroll around a location. where U is the speed in metres/second at the height y (in metres). U10 is the reference wind speed at 10 metres above the ground and the exponent N is often known as the Hellman coefficient. The Hellman coefficient is shown on the graph. For a turbulent boundary layer on a flat surface, the Hellman coefficient is typically around 1/7 = 0.143. When the wind is accelerating over high ground, the Hellman coefficient will drop below this value and, by contrast, it will tend to be larger than 1/7 in decelerating flow at the bottom of hills or in valleys. For speed estimates at other heights, there is a scroll bar that enables a user to obtain speed estimates at any height up to 80 metres. Click forward and back buttons to show different map displays. It is important to stress that the calculations on which the database is constructed makes use of the large scale geographical topography of the area but not the detailed topography - particularly the man-made contribution to the topography. In particular, it is difficult to get reliable estimates of wind speeds in urban areas because there is such variability in wind speed depending on the local building layout. Speed estimates from the database are likely to greatly over-estimate the wind speeds in urban areas which are generally so low (i.e. typically 3 to 4 metres/second) that they entirely unsuitable for wind turbine installations. 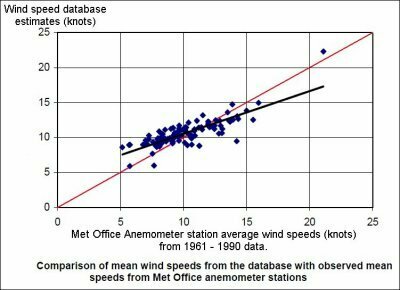 It is interesting to note a comparison between the wind speeds obtained from the database and the measured wind speeds from Meteorological Office weather stations. The figure below is obtained from the report Small-scale wind energy Technical Report. July 2008. (UK Met Office Report). It shows that there is tendency for the database to underestimate wind speeds in the range from 5 to 10 knots (i.e. 2 to 5 metres/second) but possibly to overestimate them above this speed range. However, the scatter in the results is such that not too much emphasis should be put on this comparison. It should be noted that there are other wind speed database systems – some very expensive - but there is no evidence that any one of them is significantly more accurate than the NOABL database. 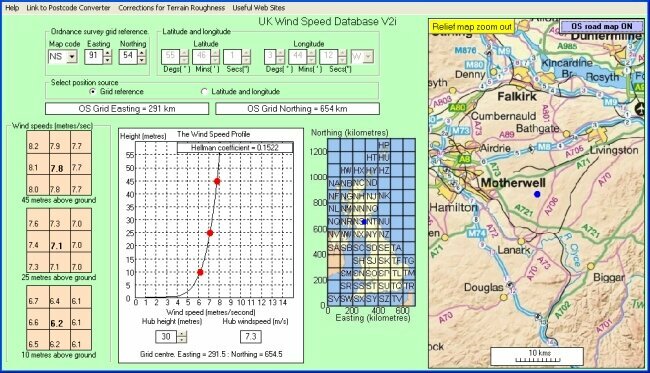 As a final example of a screen capture of the program, the figure below shows the database windspeed results for a location in Cumbria called Great Dun Fell at an elevation of 857 metres. It can be seen that the speed profile is nearly uniform because of the rapid acceleration of the flow over the top of this fell - see the discussion on the previous web page 6. In this example, the latitude and longitude was used for the position input which is shown by the blue dot on the zoomed-in map. 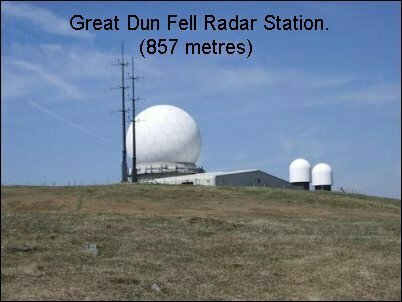 The picture below shows the top of Great Dun Fell with a radar station on the top. It would be a very good site for a wind turbine too! The NOABL database is calculated on the basis of replacing the whole of the United Kingdom with a surface roughly equivalent to a grassland and low hedgerow terrain. In consequence, the wind estimates can be significantly in error in urban areas or rural areas with woods, high hedgerows and numerous farm buildings. The flow of the natural wind over areas of high aerodynamic roughness is difficult to calculate but the Microgeneration Certificate Scheme provides a method for doing so which gives gives a useful guide to the effect of local roughness. 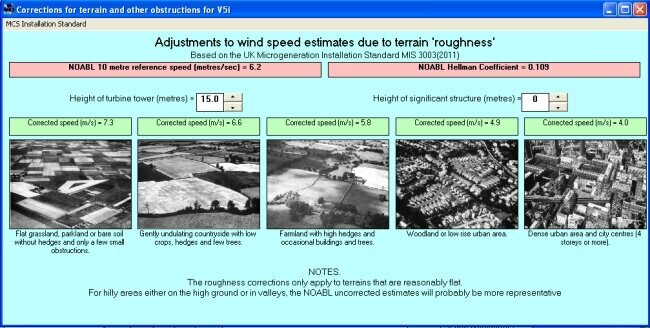 This correction procedure is built into our UK Wind Speed database program and is accessed through a menu item called Corrections for Terrain Roughness. When this menu item is selected, a window like the one shown below is opened up and, from this, corrections can be made for different types of aerodynamic roughness can be made. The program described on this page is available from our download page for a charge of £10. The next page gives links to turbine manufacturers.